How many people do you know without a phone? Pretty well anybody working in any sort of profession or a critical job will have one, even if they also have a PMR radio. We use our mobile phone for our social media, personal calls, emails, messages and entertainment; and carry it around at all times. So why would we need a pager? The traditional paging community includes volunteers or part-time users who need to receive a message wherever they are. Let’s look at some examples. In the UK, there’s the RNLI lifeboat organisation, which is staffed by volunteer crews in coastal communities. Volunteers come from all walks of life; when an emergency happens, their pagers vibrate or ring and they know they have to get to the boat. In Germany the fire service relies on part-time officers. Both types of user share characteristics such as professionalism, training and commitment. They are serious about their role, and that reflects on their willingness to carry a pager and respond when alerted. Other types of volunteer may not wish to carry a pager but would be prepared to have an application on their mobile phone and respond if available. First-aid volunteers, volunteer social workers, and others prepared to offer assistance in their community, could be said to fall into this category. The fact that there are different methods of alerting and multiple technologies is therefore a good thing, and devices and solutions can be matched to the needs of different classes of user and situation. Digital paging has been the norm in Europe for some time, but analogue paging is still in use in North America. In 1976, work began on developing a new method for wide-area paging, and in 1981 the forerunner of the ITU-R approved the digital standard that became POCSAG. Now widely used in Europe and Australia, it can operate at three speeds: 512bps, 1,200bps or 2,400bps. He adds that many manufacturers offer pagers with an uplink using cellular and that “this enables the controller or dispatcher to allocate resources more effectively to a particular incident”. Angelo Saccoccia, CEO of Swissphone, said: “We expect paging to become even more robust. We expect to see a growth in self-reliant alerting networks with emergency power supplies, multiple redundant components and alternative methods of accessing the system. These self-reliant networks will provide a fallback for TETRA and LTE voice and data networks in case of a blackout or if networks become congested. The German BDBOS network is the largest TETRA network in the world and is now widely used by the emergency services, and Motorola Solutions and Airbus are promoting TETRA paging in Germany. As this TETRA network is maturing and stable, they point to the advantages of using it as a two-way secure and resilient solution and the ease of integrating it with TETRA dispatching and control systems. Götz Kettner is the key account manager for public safety at Airbus in Germany. “The Airbus P8GR programme began with requirements in the German state of Hesse for an alerting device for professional and volunteer firemen. From the start of the project in 2013, Airbus has now rolled out 40,000 units into the field. Most users are fire personnel, but some other rescue and medical teams are using it as well,” he says. Raul Carpio from Motorola Solutions tells a similar story regarding its PG2200 two-way TETRA pager. 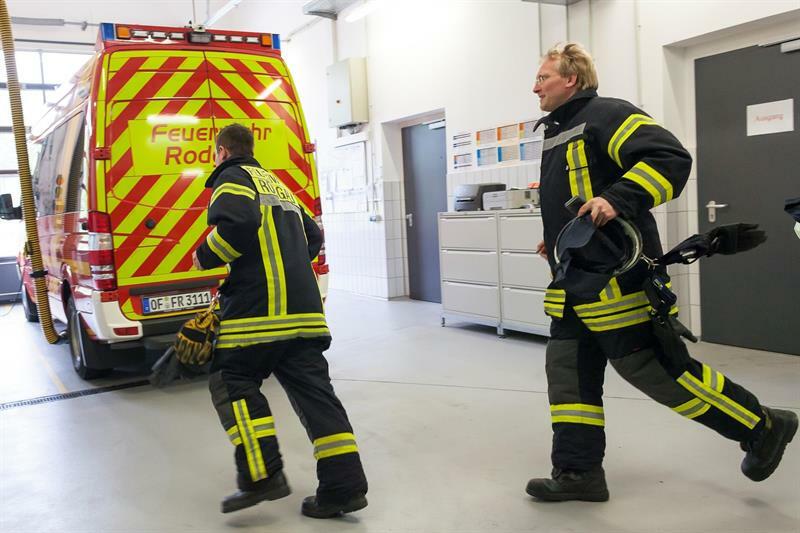 “The fire services in Germany operate with many volunteer firefighters, so they need a fast and reliable method of alerting their teams, and TETRA fits because of its coverage and security,” he says. The pager is also fitted with a man-down sensor to alert the controller in the event of user inactivity. Kettner describes how the Airbus unit is used. “As this is a two-way system, the dispatcher can send a request and then get responses from individual users to know who is available to attend the incident. The controller can then task those available and stand the others down.” Airbus provides the protocol for this to the command and control system supplier, which then integrates it into their overall solution. The user selects one of a predetermined list of status messages. Kettner adds that “in the future we are looking at providing the capability to expand the user status information to local fire stations or even mobile controllers, as well as in the Command Centre”. Carpio talks us through the Motorola Solutions back-office solution. “We have used our existing Call Out solution with the pager, this is something we have offered on our TETRA radios and it was a natural progression to offer it with the pager. Users show up on the dispatcher’s screens as the pagers are fitted with GPS satellite navigation location services. When the dispatcher is alerted to an incident they can see who is nearest either to the event or their home fire station; these people can then be sent the alert. When the user gets this, they have to respond.” Resource management is improved, and once a team is assigned, other officers are then available for another call. The back-office application also includes the ability to audit an incident after the event. There are clear similarities between the Motorola Solutions and Airbus solutions, which is no surprise as they are addressing the same market and user profile. There are many ways mobile phones can be used for alerting, and one example comes from Ciaran Mulloy of Druid Software, based in Ireland. This is an area to watch closely, potentially offering a cost-effective alternative to dedicated pagers and as 4G and later 5G networks achieve high levels of coverage. An interesting alternative for critical paging is the use of satellites. Back in the late 1990s, Motorola launched the Iridium service, which was originally intended for public use but was quickly overwhelmed by terrestrial cellular’s smaller and cheaper phones. Motorola sold the business but it has found its place as a communication service with global coverage for specialist users. Explorers, aid agencies and military are just some examples of users for this technology, which is now being updated with new satellites. Global Data Burst (GDB) is a new company offering a paging solution over Iridium. Trevor Drawbridge worked with the RNLI when it established its POCSAG network and he set up GDB with partners as he could see a space in the market. He says: “We are being approached by a significant number of potential users and are in production with the pager and repeater, with orders in hand. This technology is an ideal back-up service for blue-light organisations, it has unrivalled coverage and availability. It always works. I can see that the UK, for example, could use this as a complement to the Emergency Services Network.” GDB also offers a signal booster to extend indoor coverage. The answer to the question “Which pager technology should I use?” clearly depends on whom you ask. There are strong adherents for both POCSAG and TETRA as the technology of choice, and we’re watching the race between the two that is taking place in Germany with interest. In other countries the existing networks will be a major factor. POCSAG is still widely used and deployed, and suppliers are developing new devices with two-way capability and links to accessories and body sensors to offer additional functions and safety features. Geolocation adds greatly to the capability. TETRA pagers are an option for alerting, with built-in two-way capability and high levels of security and location, as well as ease of integration in the control room. Mobile phones are also an option, now available with back-office control solutions. Specialist users can take advantage of satellite paging when working in remote situations. The best advice is to be clear about the system and user requirements before engaging with any one supplier, and keep an open mind about which technology to choose. Engaging with the public safety agencies in nations such as Belgium and the Netherlands where pagers are used alongside TETRA could also be beneficial.